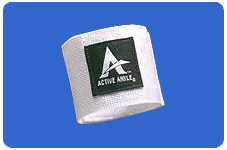 The T2 active ankle support, is state of the art ankle protection gear. It's feather light EVA padding system hugs every contour of the ankle for an incredibly snug, comfortable fit. And the durable, quick-fit single strap system is adjustable for both high and low top shoes. The Active Ankle offers flexibility and security. 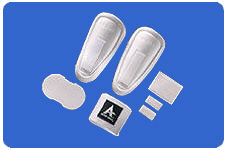 It will feel different from anything you have ever worn for ankle protection. The hinge allows freedom of motion that you may not be accustomed to. Do not mistake this freedom of movement for lack of support. A leading university said, the Active Ankle provides more support (inversion) than the leading air-stirrup brace, the leading lace-up brace, or a tape job. The T2 Active Ankle refurbishing kit contains all new Velcro straps, heel pad and interchangeable E.V.A cushioning systems for use with the T2 Active Ankle Support. It is available in white or black colors. Available in Small or Medium/Large (Medium and Large are interchangeable in the refurbishing kits). See size chart above. The T2 Active Ankle replacement strap is available in white or black colors. Available in Small or Medium/Large (Medium and Large are interchangeable in the replacement strap kits). See size chart above. You don't have to buy one of each color on the Chameleon Active Ankle Brace. Just buy one base color brace (white or black) and receive all eight colorful straps. They are removable and stay firmly in place. The proven design of the Chameleon brace provides a comfortable combination of convenience and strength, and is recommended for anyone seeking to prevent ankle injury. Carbon Charged Protection - Blend of carbon and polypropylene adds a new dimension. Gliding hinges does not restrict ankle mobility and allows more fluid motion where you can get better performance.